Protected: Finally, Halloween 2009 Pictures ONLINE! Posted in Fun times. Tags: fun, Halloween, Picasa, pictures. Enter your password to view comments. This is great. Show it to all the kids (and kids at heart) you know who love science. Got this the other day by e-mail and had to share it. 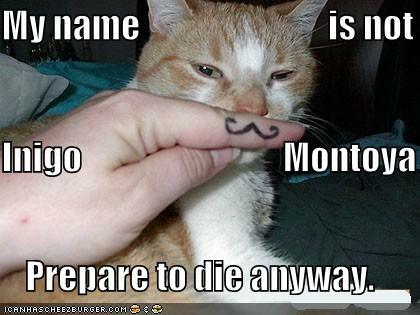 I did once use the line “my name is Inigo Montoya…” in an online dating profile and it worked quite well. The Princess Bride is a movie among movies, it’s wonderful. I also have had cat(s)…this is apt. Found it online at http://lunaticrising.net/main.php?g2_itemId=60 among other places, not sure of appropriate credit but perhaps icanhascheezeburger.com? Posted in Families. Tags: fun, Jordan, party, Picasa, pictures, wedding, women. Enter your password to view comments. I soooo wanna take a ride! Who remembers the Hindenburg anyway? Perhaps the only thing cooler than being powered by lightweight photovoltaic cells, this airship is also designed to rest on land or water.